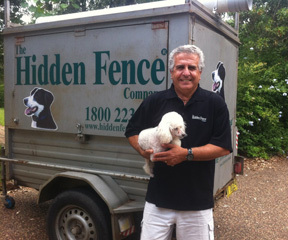 WHAT’S MOST SATISFYING ABOUT BEING A HIDDEN FENCE PROFESSIONAL OF SYDNEY AND THE HILLS? The fact that we can remove a lot of stress from client’s lives by solving their dogs escaping behaviour. WHAT’S YOUR FAVOURITE BREED OF DOG TO TRAIN TO AN ELECTRONIC DOG FENCE CONTAINMENT SYSTEM, AND WHY? Labradors and Golden Retrievers. They are intelligent and receptive to training. They also have a good nature. WHAT’S YOUR FAVOURITE HIDDEN FENCE DOG CONTAINMENT SYSTEM TO USE IN THE FIELD, AND WHY? The top of the range PT4 dog fence system because it has all the features and benefits and at the same time allowing the client total flexibility for the client. DO YOU HAVE A GOOD STORY TO SHARE ABOUT CONTAINING A CUSTOMERS PET? We installed a system for a well known radio personality at Kenthurst in Sydney’s north west. He did the night shift, and was not able to get a good sleep because his 2 Alsatians kept escaping and barking at passing people and cars. He was a little sceptical at first, but once he saw the dogs contained and behaving, and getting his sleep during the day, he was so impressed he raved about his Hidden Fence System and The Hidden fence Company on his radio programme for weeks afterwards – which in turn brought in more business. Win – Win for everyone.